Folk and pop may seem like two genres that would not get along if you forced them to hang out with each other. However, Wake Owl, the Vancouver sextet, has effortlessly combined the two styles into catchy yet thoughtful songs that appeal to folk purists as well as new listeners. 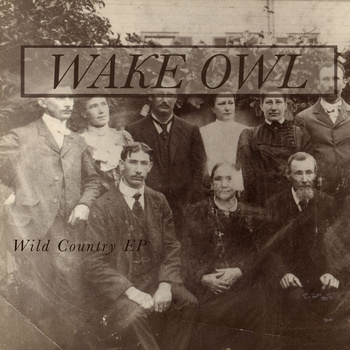 Released this past November, Wild Country, the first EP from Wake Owl, offers up five tracks filled with tender acoustics and violins, Colyn Cameron’s raspy vocals, and foot-stomping choruses to make you feel both nostalgic and optimistic. At first listen, “Wild Country” feels like a song about hopelessness. But with a careful second listen, you realize that “Wild Country” is about turning hopelessness into empowerment and has one of Wake Owl’s most memorable lyrics. I’m never gonna chase something, it’s a total waste running. The subtle violins give this track a simple beauty that helps make “Wild Country” the most personal song on the EP. I probably haven’t gone fishing in about 20 years but I imagine drifting in a tiny rowboat, feet hanging over into the water, casting a line and following the current while Wild Country plays in the background.